The program has completed it's second contractual phase but no longer has federal funds for additional training. SSTN staff are still available to provide advice to those educational institutions interested in developing their own solar training programs. Staff can also provide advice to individuals interested in solar careers. The Southeast Solar Training Network is a U.S. Department of Energy (DOE) funded five-year effort that creates a geographic network offering training programs in solar installations across the southeastern region of the U.S. The program is currently in its second phase. See Success Stories of the program. To address critical solar energy industry needs for high-quality, local, and accessible training in solar system design, installation and inspection. The training network provides train-the-trainer instruction to educational faculty/instructors in photovoltaics (PV) and solar water heating (SWH) from institutions designated by the Energy Offices in the nine partner states and territories. The trained instructors then conduct training in PV and SWH at their educational institutions. The Interstate Renewable Energy Council (IREC) is the National Administrator for the Solar Instructor Training Network. IREC works closely with the Regional Training Partners, facilitating and supporting the creation of a well-trained, highly-qualified solar energy workforce of sufficient size and diversity to meet the projected needs of this country. The IREC Solar Instructor Training Network web site provides a listing of regional training partners, training resources, future events, and highlights the work that has been conducted to date. For a listing of the participating educational institutions and a detailed location view of the institutions, click on the above map. 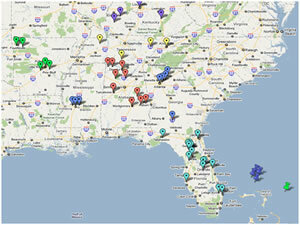 Once at the expanded map view, click on the pins to obtain links to the educational institutions. Use your mouse or the map zoom in or out feature to get closer views. In addition you can also see the Partners site. Provide regional forums regarding instructor training.